Finally, I am happy with the first three books in my #Lives series. They have been re-edited, polished and re-covered…. and now I can move on. PayBack, my current WIP, is well under way and already has a pretty good cover. I just need to settle down and finish it. I’m off to update my book page! Have you ever had the feeling that you have bitten off more than you can chew? Well, right now I seem to have a mouthful! I have just finished re-editing my first book, Nine Lives. This was after making the mistake of actually opening the book and reading a few pages. After I got over the shock of seeing how bad it was, I realised it needs either a major new edit or bin it. That wasn’t really an option, so I spent a couple of weeks going over it with a fine-toothed comb. It now has a brand new cover and is republished on Amazon. I have to finish the formatting for the paperback version, then I will have restored the status quo for this book at least. I will be repeating this process for my other two books, for they might need an overhaul too! At the same time, I have been busy editing our holiday memoir, Lazy Days, getting it ready for publication. We wanted to enter it with Kindlescout but they don’t accept novellas. If you remember, we entered in 2015 with Let it Go….. and I thought it did well. It didn’t win, but I enjoyed the exciting process! Now, what else have we been doing? Oh yes, we have announced a book tour for Lazy Days in January 2018. The 8th to the 12th, if anyone wants to take part! 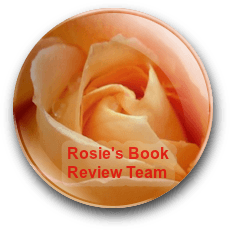 We will be taking part in Lizzie Chantree’s book tour in January for Ninja School Mum, and I am reviewing Sacha Black’s book Keepers for Rosie Ambers review team. Seriously thinking of making some new book trailers too and I have been trying to make sense of my writing/ blogging bible. Over the years, so much information has been added, changed or deleted; it’s a bit of a mess. So I bought myself a new book to transcribe all the valuable stuff into. This undertaking might be the straw that breaks this camel’s back as I can’t make sense of my scribble. Why on earth did I let get it into such a mess in the first place? Oh yes, we are planning a massive promotion for Anita’s book, Let it Go, starting with a Kindle promo next week. For some reason, we have neglected this book and this won’t do at all. So you have been warned! Although we are very busy at the moment, I haven’t been able to do much work on PayBack, my new WIP, and not happy about that at all. But I am discovering that there is only so much you can get an ageing brain to cope with, unfortunately. It occurs to me that doing one thing at a time sounds like a better idea, but how can you, when there is so much you want to do? I’m not sure if this is something authors do, but I am so chuffed, I have to share this with everyone! Emma Powell, from The Review2014.blogspot.com is reviewing my mystery thriller trilogy, and the first one has blown my mind! The story is cleverly written in the sense the author has achieved something different. Not easy to do these days but a joy to discover when you find it. The whole book keeps the protagonist – hereafter called Kate – centre stage whilst keeping the tension, the what-the-hell-happens-next thread, going from beginning to end. There is the Voice inside Kate’s head that is her instinct, her sub-conscious speaking to her to the point where the reader begins to wonder if Kate has mental health issues. Actually, it doesn’t take long to realise we’ve all got that Voice rattling around in our consciousness at some point or other and this leads onto the reader being in Kate’s head; her emotions become your emotions, her fears are palpable. And there you have it. The author keeps the mystery, the thrill right up there, weaving in and out of every word you read. The characters that are vital to Kate’s story come to your attention so subtlety until suddenly, you wonder how they got there. And how long they may last! Whilst I felt the conclusion to The Ninth Life ended a tad too soon – I would have enjoyed a more drawn-out scene for the climax – this does not deviate from the overall enjoyment of the book. And besides, Kate’s story is a trilogy, thankfully. Book Two – The Last Life – picks up and carries yet another tension-riddled read around Kate and her struggles. Watch out for the review of The Last Life in the not-too-distant-future. As soon as I’ve completed Book 3 of the Trilogy, The Broken Life, I’ll be posting about that too. 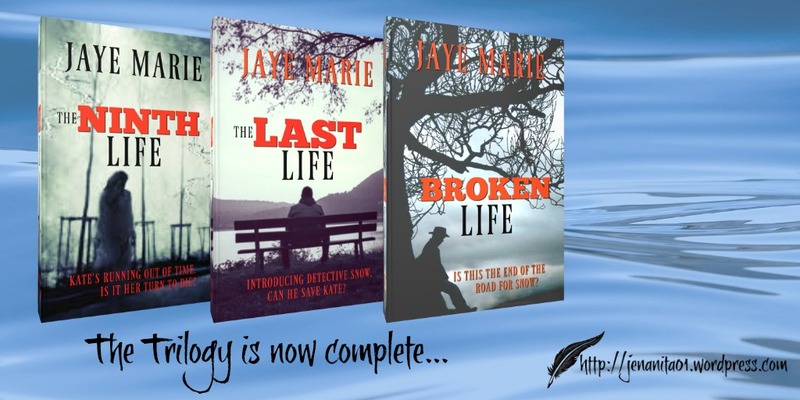 Look out for an Author Interview on the Blog with Jaye Marie shortly! I may not come down to earth until after Christmas! I just had to share the latest surprise to come from our attempts to spread the word about our books. We have run KDP promotions before with varying degrees of success, for instance, Anita’s book Secrets had 37 uptakes which I thought was pretty good, considering we are beginners after all. The Ninth Life is due to leave Kindle Select soon, as I wanted to put it on Smashwords to see if it did any better. So before that happened, I did one final promotion on Kindle Select. This post came about because I wanted to try and thank everyone who picked up a copy. I sincerely hope you enjoy reading The Ninth Life, and if you do, to remind you that a short and simple review on Amazon from you would be wonderful. The fact that I will love you forever is not designed to influence you in any way at all! Amazon are running a promotion this October called PoweredByIndie. Basically to celebrate authors who self publish with them. They are highlighting as many as they can, but suggest we all blow a few trumpets too. This we can do, because we like blowing trumpets, and have learned more as an Indie than as anything else. When I think back to how our lives used to be, long before the days of self-publishing, I am totally amazed at how far we have come. Sometimes, we had been encouraged to hope for more than that, when they had actually requested the full copy of the book to read, but it never got any better than that. At one point, we managed to get an agent, a very respectable London firm, who thought our books were eminently publishable. They tried hard to create some interest, but the results were the same. Just when it all seemed hopeless, the Indie publishing revolution arrived! The more we read about it, the more intrigued we became. We could do this! It has been a long journey and the learning curve even longer, but we are now fully-fledged Indie authors with eight books to our name. The experience has been frustrating at times, yet very rewarding. Understandable really, for by the time you have spent several weeks’ months ripping plots and storylines out of your heart and soul, thousands of words and all those emotions and tension later, the last thing you feel like doing is actually looking at it again. Mind you, most of us approach it in the wrong way, with a totally wrong mind set. I know all about this, for I have to live with a wonky mind set! I have discovered that if you make editing a proper job, dare I say discipline, it makes it easier. But before you do anything, you must put it away in a drawer and forget it for at least two weeks. More, if you can. I always underestimated the value of doing this, for no matter how long you waited; you would still be in the zone, immune to all your errors, wouldn’t you? But it does help. Not sure how, but it does. Decide how much you will do everyday. And be realistic, make it achievable. If you decide on one hour, that’s fine. If you stick to the plan religiously, you will get there in no time AND feel better about the whole business. You will need your chapter breakdown handy, something you should have already? Decide where you will work, and this is more important than you think. In the early days, I found myself trying to edit on my lap, or squashed in front of my computer. Worst of all, is trying to edit in the same room as the television. I find the best way to edit is with a paperback copy, but as this isn’t always convenient, I print out the MS, using large print and double spacing. If, like me, you tend to give your characters their own chapters, edit them separately. This is a brilliant way to know if you have done them justice, with no lapses in their lifestyle or heaven forbid, important details like their names. This first read-through is to make sure the story runs smoothly, no gaping plot holes or lack of continuation. Don’t set out to look for weak words, typos or appalling grammar at this stage. That will follow, once the nuts and bolts are all there and done up tight. I never knew this blog would turn out to be a very important part of my little writing kingdom, when I first decided to see if I could create one. Everyone said at the time that as the blog improved, so would I. That you must treat it like a child, feed it and nourish it, even learn to love it, and it will make you a better writer, if not a better person. What it has given me is confidence. It has also provided some much needed discipline, for although it is only a ‘blog’ it is governed by the same rules as any other writing. The content should be the very best you can do, none of that ‘oh, that will do’ attitude. I have learned far more about writing since creating this blog and reading other people’s. Those who haven’t tried it don’t have a clue and tend to dismiss them as harmless time wasting. People will not fall over themselves to read what you write, whether it is a letter, blog or full-length novel unless you are well known and/or famous. You have to create a written magnet, one that will attract attention. One that people will love to discover and keep coming back to. In the years I have been building this blog, I have discovered many such magnets and they are as good as reading a book. My day would not be complete without these ‘mini reads’! I have always been of the opinion that if you want to learn how to do something, study those who have already learned and succeeded, for you will discover that they have risen to the challenge and not been found wanting. Some of them will even tell you the right way to go about it! This is how I learned to cook, knit, wallpaper a wall and even change the carburettor in an old Triumph car. Not to mention all my craft projects. My theory is, if someone made it in the first place you can have a go too. It’s not really rocket science, but the important thing to remember is the quality of your achievement. None of my first attempts were any good, but if you are stubborn like me, it helps a lot and eventually you will manage something you are happy with. The little tree in this photograph was my rendition of the ‘Tree of Souls’ from the film Avatar. It took a month to make and involved thousands of tiny pearl beads! Despite all my other interests, I have always wanted to be a writer. I enjoyed English at school and ideas for stories have surfaced from time to time over the years, but overall I was much too busy trying to live my life without too much heartache, and failing miserably. And this blog (and others like it) will be my benchmark. I have now self-published two mystery thriller books, and editing the third. Reasonably happy with my progress, although to be honest, I never expected it to be so hard. Not the writing you understand, but everything else you have to do has added years to my life!